So you have your emergency kit, grab bag, and stockpile all sorted, or at least are planning to I dare say. This week Bec and I will be doing a few posts about Restock and Rotating your booty, I mean stockpile. Things like first aid kits don’t need too much maintenance, just a six monthly check for items that you may have used, but food definitely needs fairly close attention to avoid spoiling. 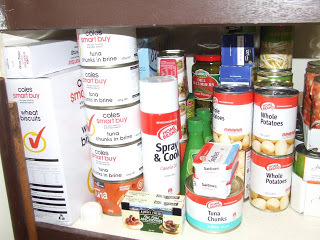 Food in tins have a long shelf life, as does UHT Milk and do not need too much attention. When we restock, we simply put the old stuff to the front and new stuff to the back. Just basic stock rotation, just like any store owner would practice. We do the same with fresh food as well. In the fridge we have two crisper compartments and rotate between them. For example one week we put garden harvest in the top one, and the next week rotate to the bottom draw and keep using the top until empty. Then rotate. We find this works wonderfully, and we rarely have any spoiled fruit and vegetables. 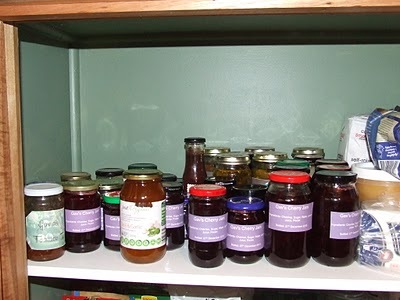 One of the great things about having a food forest around your house is that most of the storage is in the garden itself. You just pick when you need it! Dried goods need a little more attention, with flour susceptible to weevils, and dried beans sensitive to high humidity. We use airtight plastic storage containers to keep anything out of opened or damaged packets, and I know from experience that in the sub tropics it is best to store your flour in the freezer to kill off any weevil eggs before they hatch. We don’t have too many problems with our flour, but keep it airtight anyway. The method Kim and I use each week, is to write down items on a list as we use them. I have a small whyteboard that Ben gave us, and I am going to mount that on the back of the pantry door. 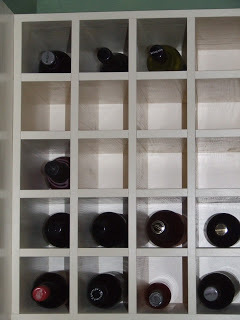 This way, it will make it a lot easier each month to restock, as we will have a better idea of what we have used. However, all this talk about restocking brings me to one big problem we are now facing. Increasing global food shortages. A very scary subject indeed. Today in The Age there was this article titled “Fruit and vegetables set to rise more than 70 per cent“, which talks about the recent floods and it effect on food prices. Then I found this one in the Irish Independent titled “Never mind banks in crisis, food prices are our real worry” which talks about commodity prices. The icing on the cake for me was this article by Associated Press titled “Egyptians stock up on food, water as protests rage” which talks about the political unrest over the weekend. As I have written before, there are troubled times ahead, it pays to be prepared. So what can we do about it, and keep our own families fed at a reasonable price? Well, I have said this many times, and you are probably getting sick of me harping on about it, but grow and preserve your own food. You will probably never become self sufficient on a suburban block, but I have managed to supplement at least 50% of our fresh food bill with home grown produce. Even the odd chook or seven will come in handy if you can keep them fed for a decent price. In January alone, my seven chickens produced 108 eggs, or 9 dozen, for the cost of $30 in feed. At approx $6.50 a doz for free range eggs in the store which would have cost me $58.50, that is a saving of $28.50 per month. It is even more of a saving when all the hens are laying, due to the fact that 3 of mine are moulting and are off the lay this month. Growing your own food is a satisfying feeling, knowing that you are providing for your own families well being. If you do choose to grow your own food, make sure you have an ample seed supply as well. Another way to save is to buy in bulk. We buy most items in the biggest size we can get, because it is substantially cheaper than smaller quantities. If you don’t believe me, try checking this out. The next time you go to a supermarket, check out the price per 100gm. Most Aussie supermarkets list this calculation with their item price. You will find bulk items up to $1.00 or more cheaper per kilogram! We buy bulk sugar, flour, dried beans, rice, salt, milk, vegetables, etc. You get the basic gist of it. Even better, if you can source a local food co-op and join up, you will find even better bulk food prices, without all that packaging. During this week, I will do a bit of research for bulk food stores in each Aussie capital city, and list as many as I can. So where is the task for today, I here you ask. Well I feel that I have only scratched the surface, and I dare say there are lots of other ways to keep your regular restocking costs to a minimum whilst still maintaining an adequate supply for whatever crisis you are planning for! The task is for anyone that has any other restocking on the cheap suggestions, please leave them via a comment for all readers to enjoy and digest. Also, if readers would like to share any food co-ops they know of and use frequently, please leave a comment as well. It doesn’t matter where you live in the world, share the wealth and list your favourite co-op. Ready for the next part of the challenge. Bec has been running wild over at her blog this week with the Aquire part of the challenge. Check out her posts for the week. and my post for the week Acquire #1 (Task 1 – Inventory). So far, so good I hope. The next task is to begin to stockpile. 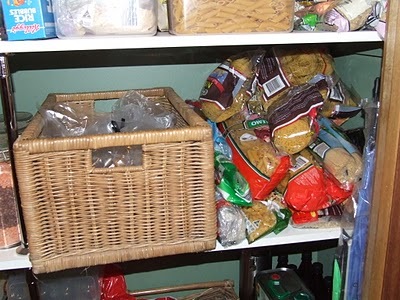 Bec has already covered off the basics non-food items to collect in step 3, so I won’t repeat it. However, what sort of food would you need for a short crisis? Will you have enough for a month, preferably at least 10 weeks? Where do I start I hear you asking? Well, there are many lists out there and here are a few good references that I have referred to in the past. 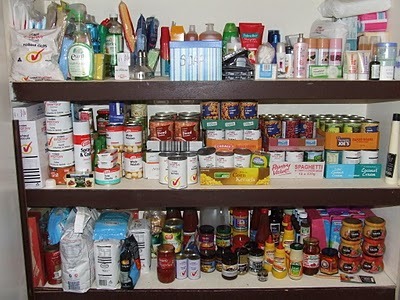 Australia’s Emergency Pantry List has an Interactive Pantry List that you can fill in. 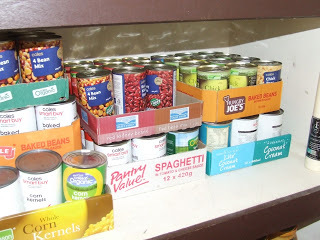 Rhonda at Down to Earth wrote “Saving money with a stockpile“, which was the first time I encountered the concept. University of Sydney’s site called “Food Lifeboat“, has a very good list that details how much food is required each day, and a shopping list to help you prepare for 10 weeks. All very informative lists and all of them should give you some ideas. Start off with a few items you don’t have, especially if you are strapped for cash. Each week buy a little extra once you have figured out what you need. You will soon find that you will have a substantial stockpile ready for use and any crisis that I hope does not eventuate. It doesn’t have to be expensive when you stockpile because good bought in bulk are often discounted. Just do your own sums when you go shopping. If you have a bulk food co-op close by, then that is the ideal place to start. So what do I stockpile? Well the list is long, so how about I just show you via photos instead! Just remember to click to enlarge. 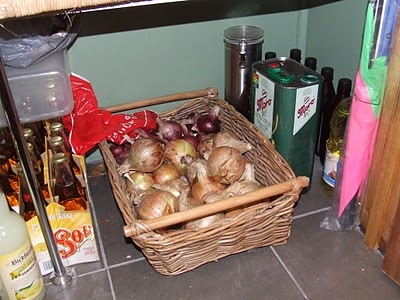 This is our main stockpile cupboard. Shelf two has cleaning and personal hygiene products. 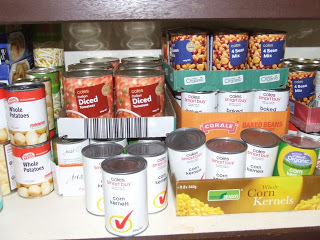 Shelf 3 has cereals, tinned food like tuna, potatoes, beans, corn, baked beans, spaghetti, coconut milk, chickpeas and a few other. 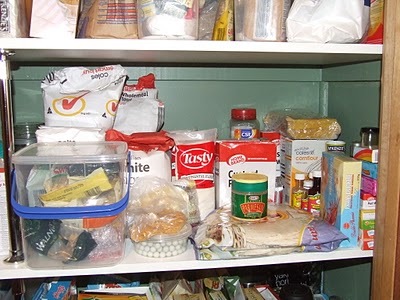 Shelf four has flour, sugar, sauces, pastes, UHT milk. The floor has rices, toilet rolls, and non-stockpile items. Have a closer look below. 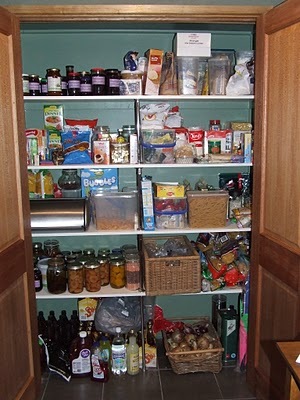 Turn a full 180 degrees on the spot and you see the pantry cupboard, which also hold lots of stockpiled goods. 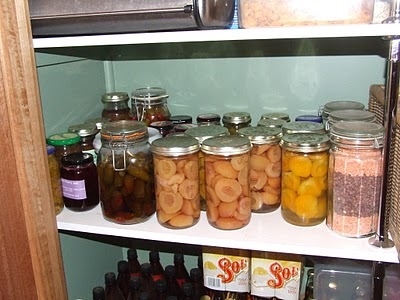 Preserved fruit and vegetables, and dried lentils. Don’t forget the wine. I always have a few on hand. Nice and neat, so you can see at a glance what you have. All the stuff in cans are ready to eat if you cannot heat them. Don’t forget to keep a couple of can openers at hand! And finally, don’t forget some protein. If you eat meat, then get some canned as it last longer and you are not reliant on the fridge/freezer if the power goes out. If you are a veggie, then you will have lots of beans, and dried pulses on hand. Now one thing I haven’t shown you is the stock feed for the chickens. If you have animals don’t forget them in the scheme of things. I have two spare 20kg bags of feed the shed for the chooks, so we are kept in fresh eggs in-case of emergency. If worst comes to worst, I would let them forage around to find lots of bugs and weeds. Don’t forget your dogs and cats food as well. 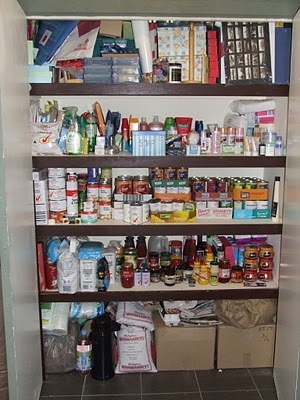 As stockpiling is a personal choice, I am not going to give you a list to follow. Everybody’s diet is different, so the great thing is that you get to choose what you want. Go for it, and remember that Rome was not built in a day. 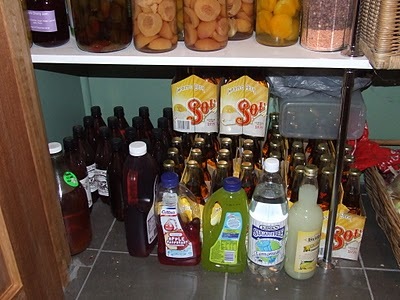 Our stockpile took about a year to collect, but simple to maintain once you have all your needs. Maintenance or Restock & Rotate is a post for next week. 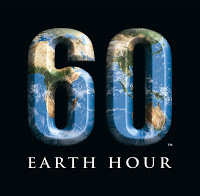 Earth Hour, 8.30pm, Saturday 26th March 2011. This year, lets go beyond the one off event of 60 minutes of abstinence. So to that end, I have decided to help out WWF to ensure the message goes beyond the one single hour that people turn off their lights or power. 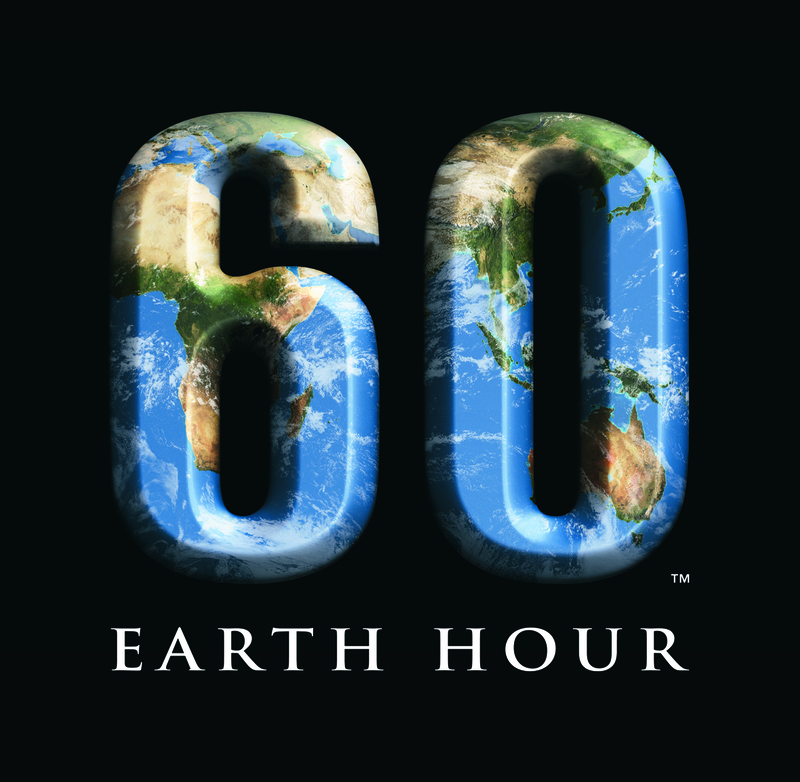 This year WWF are holding the Earth Hour Awards that I have offered to help promote and be a preliminary judge. Here is the blurb from their site, and please note that the apply and nominate pop-ups work from the links, but not a well as on their main site. Here are all the categories that you can nominate people in. So stay tuned as I receive more information from the promoters. It is going to be a great event!